I provide absolutely no guarantee, neither for the accuracy of this documentation nor for any property or feature of the software described here. Do not use this software in critical situations or projects. For my information see this blog post as a starting point. I’d like to thank all the people working at the Spring Eco System for doing their amazing work. Also a big thank you to Dr. Gernot Starke and Dr. Peter Hruschka for their inspiring workshop "Mastering Software Architecture" in Munich, December 2015. I took not only a nice CPSA-F certificate home, but really valuable and practical patterns for improving "my" software. The main purpose of biking2 is keeping track of bicycles and their milages as well as converting Garmin Training Center XML (tcx) files to standard GPS Exchange Format (GPX) files and storing them in an accessible way. In addition biking2 is used to study and evaluate technology, patterns and frameworks. The functional requirements are simple enough to leave enough room for concentration on quality goals. The application must only handle exactly one user with write permissions. Most bike aficionados have problems understanding the question "why more than one bike? ", the system should be able to keep track of everything between 2 and 10 bikes for one user, storing 1 total milage per bike and month. All milages per month, year and other metrics should be derived from this running total, so that the user only need to look at his odometer and enter the value. The application should store an "unlimited" number of tracks. The images should be collected from Daily Fratze, the source are all images that are tagged with "Radtour". In addition the user should be able to provide an "unlimited" number of "gallery pictures" together with a date and a short description. The functional requirements are simple enough to allow a simple, understandable solution that allows focus on learning about new Java 8 features, Spring Boot and AngularJS. Collecting milage data should be a no brainer: Reading the milage from an odometer and entering it. The application should provide a simple API that allows access to new clients. Collected milages should be presented in easy to grasp charts. The architecture should allow easy testing of all main building blocks. Developers who want to learn about developing modern applications with Spring Boot and various frontends, preferable using Java 8 in the backend. Bike aficionados that are looking for a non-excel, self-hosted solution to keep track of their bikes and milages. Looking for an arc42 example; want to get ideas for their daily work. Improving his skills; wants to blog about Spring Boot; looking for a topic he can eventually hold a talk about; needed a project to try out new Java 8 features. The few constraints on this project are reflected in the final solution. This section shows them and if applicable, their motivation. The application should be part of a Java 8 and Spring Boot show case. The interface (i.e. the api) should be language and framework agnostic, however. It should be possible that clients can be implemented using various frameworks and languages.. The interested developer or architect should be able to check out the sources, compile and run the application without problems compiling or installing dependencies. All external dependencies should be available via the package manager of the operation system or at least through an installer. Memory can be limited (due to availability on a shared host or deployment to cloud based host). If deployed to a cloud based solution, every megabyte of memory costs. Start in early 2014 with Spring Boot beta based prototypes running on Java 8 early access builds, first "release" version March 2014 together with the initial release of Java 8. Upgrade to a final Spring Boot release when they are available. No need to continue the editor and IDE wars. The project must be compilable on the command line via standard build tools. Due to OC2 there is only one IDE supporting Java 8 features out of the box: NetBeans 8 beta and release candidates. Private git repository with a complete commit history and a public master branch pushed to GitHub and linked a project blog. Use JUnit to prove functional correctness and integration tests and JaCoCo to ensure a high test coverage (at least 90%). The source, including documentation, should be published as Open Source under the Apache 2 License. The project uses the Code Conventions for the Java TM Programming Language. The conventions are enforced through Checkstyle. English. The project and the corresponding blog targets an international audience, so English should be used throughout the whole project. All Java types must be located in packages that start with ac.simons. All Java types must be located in packages that contains the artifactId of the Maven Project. All Java types annotated as @Entity must have a name that ends with the suffix Entity. NOT t.name ends with "Entity"
All Java types that represent a repository must have a name that ends with the suffix Repository. AND NOT t.name ends with "Repository"
This chapter describes the environment and context of biking2: Who uses the system and on which other system does biking2 depend. A passionate biker uses biking2 to manage his bikes, milages, tracks and also visual memories (aka images) taken on tours etc. He also wants to embed his tracks as interactive maps on other websites. Daily Fratze provides a list of images tagged with certain topics. biking2 should collect all images for a given user tagged with "Theme/Radtour". GPSBabel is a command line utility for manipulating GPS related files in various ways. biking2 uses it to convert TCX into GPX files. The heaving lifting is done by GPSBabel and the resulting file will be managed by biking2. The user may want to embed (or brag with) tracks on arbitrary websites. He only wants to paste a link to a track on a website that supports embedded content to embed a map with the given track. The api runs on a supported application server, using either an embedded container or an external container. It communicates via operating system processes with GPSBabel on the same server. The connection to Daily Fratze is http based RSS-feed. The feed is paginated and provides all images with a given tag but older images may not be available any more when the owner decided to add a digital expiry. Furthermore biking2 provides an oEmbed interface for all tracks stored in the system. Arbitrary websites supporting that protocol can request embeddable content over http knowing only a link to the track without working on the track or map apis themselves. The frontend is implemented with two different components, the biking2::spa (Single Page Application) is part of this package. The spa runs in any modern web browser and communicates via http with the api. At the core of biking2 is a simple yet powerful domain model based on a few entities of which a "Bike" and it’s "Milage" are the most important. Although data centric, the application resigns from using too much SQL for creating reports, summaries and such but tries to achieve that with new Java 8 features around streams, lambdas and map/reduce functions. Building the application with Spring Boot is an obvious choice as one of the main quality goals is learning about it. But furthermore using Spring Boot as a "framework" for Spring Framework allows concentration on the business logic. On the one hand there is no need to understand a complex XML configuration and on the other hand all building blocks are still put together using dependency injection. Regarding dependency injection and testability: All injection should be done via constructor injection, setter injection is only allowed when there’s no other technical way. This way units under tests can only be correctly instantiated. Otherwise one tends to forget collaborators or even worse: 20 injected attributes may not hurt, but a constructor with 20 parameters will. This hopefully prevents centralized "god classes" that control pretty much every other aspect of the application. Spring Boot applications can be packaged as single, "fat jar" files. Since Spring Boot 1.3 those files contain a startup script and can be directly linked to /etc/init.d on a standard Linux systems which serves [TC4]. Interoperability will be achieved by using JSON over simple http protocol for the main API. Security is not the main focus of this application. It should be secure enough to prevent others from tempering with the data, confidentiality is not a main concern (read: passwords can be transmitted in plain over http). The internal single page application shall be implemented using AngularJS. The deployable artifact will contain this application so there is no need for hosting a second webserver for the static files. For real time tracking the MQTT protocol will be used which is part of Apache ActiveMQ, supported out of the box by Spring Messaging. Graphing should not be implemented here but instead the Highcharts library should be used. The configuration for all charts should be computed server side. From those two we have a closer look at the api only. For details regarding the structure of an AngularJS 1.2.x application, have a look at their developers guide. To comply with the Java coding style guidelines, the modules "bikingPictures" and "galleryPictures" reside in the Java packages "bikingpictures" and "gallerypictures". I used functional decomposition to separate responsibilities. 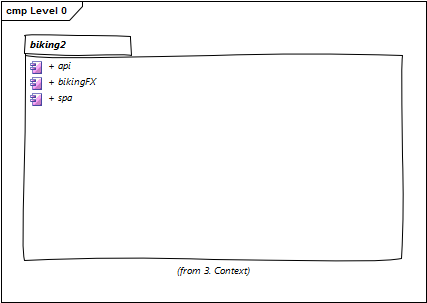 The single parts of the api are all encapsulated in their own components, represented as Java packages. All components depend on a standard JPA EntityManager and some on local file storage. I won’t go into detail for those blackboxes. Managing bikes, adding monthly milages, computing statistics and generating charts. Uploading tracks (TCX files), converting to GPX, providing an oEmbed interface. MQTT and STOMP interface for creating new locations and providing them in real time on websockets via stomp. Reading biking pictures from an RSS feed provided by Daily Fratze and providing an API to them. Top level packages should conform to the main building blocks. Returns support and shared packages. REST api containing methods for reading, adding and decommissioning bikes and for adding milages to single bikes. Methods for retrieving statistics as fully setup chart definitions. REST api for uploading and reading TCX files. REST api for adding new trips. HTTP based oEmbed interface, generating URLs with embeddable content. WebSocket / STOMP based interface on which new locations are published. 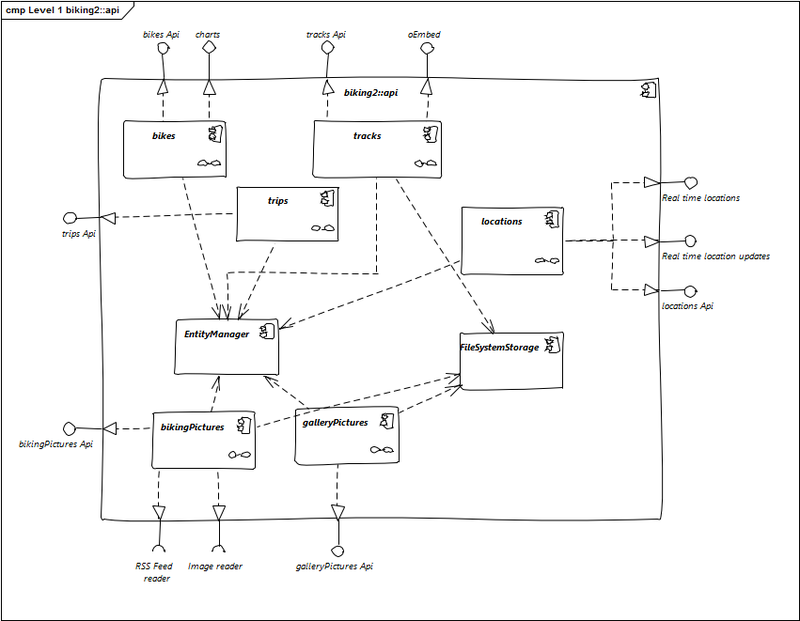 MQTT interface to which MQTT compatible systems like OwnTracks can offer location updates. Needs an Daily Fratze OAuth token for accessing a RSS feed containing biking pictures which are than grabbed from Daily Fratze. REST api for uploading and reading arbitrary image files (pictures related to biking). bikes provides the external API for reading, creating and manipulating bikes and their milages as well as computing statistics and generating charts. Contains all methods for manipulating bikes and their milages. Contains all methods for generating charts. The bikes module and all of its dependencies are contained inside the Java package ac.simons.biking2.bikes. tracks manages file uploads (TCX files), converts them to GPX files and computes their surrounding rectangle (envelope) using GPSBabel. It also provides the oEmbed interface that resolves URLS to embeddable tracks. Contains all methods for manipulating tracks. Resolve track URLs to embeddable tracks (content). 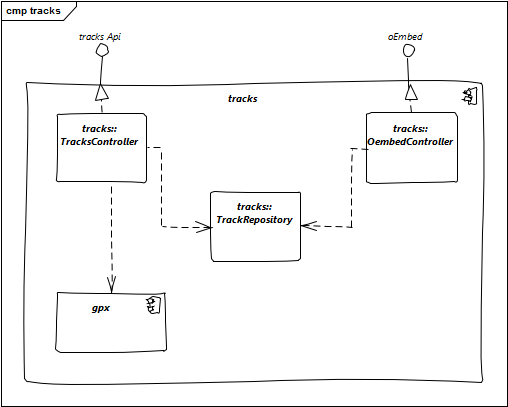 The tracks module and all of its dependencies are contained inside the Java package ac.simons.biking2.tracks. trips manages distances that have been covered on single days without relationships to bikes. Contains all methods for manipulating trips. The trips module and all of its dependencies are contained inside the Java package ac.simons.biking2.trips. locations stores locations with timestamps in near realtime and provides access to locations for the last 30 minutes. For retrieving all locations in the last 30 minutes. Interface for getting notifcation on new locations. Listens for new locations coming in via MQTT in OwnTracks format. The locations module and all of its dependencies are contained inside the Java package ac.simons.biking2.tracker. The module is configured through ac.simons.biking2.config.TrackerConfig. bikingPictures is used for regularly checking a RSS feed from Daily Fratze collecting new images and storing them locally. It also provides an API for getting all collected images. Provides access to the Daily Fratze RSS Feed. Provides access to images hosted on Daily Fratze. Contains all methods for accessing biking pictures. The bikingPictures module and all of its dependencies are contained inside the Java package ac.simons.biking2.bikingpictures. galleryPictures manages file uploads (images). It stores them locally and provides an RSS interface for getting metadata and image data. Contains all methods for adding and reading arbitrary pictures. The galleryPictures module and all of its dependencies are contained inside the Java package ac.simons.biking2.gallerypictures. 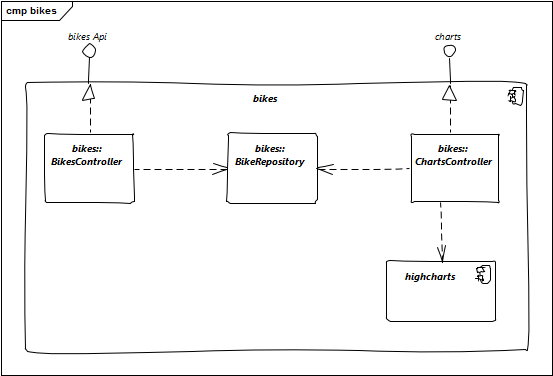 The BikeRepository is a Spring Data JPA based repository for BikeEntities. The BikeController and the ChartsController access it to retrieve and store instances of BikeEntity and provide external interfaces. Contains logic for generating configurations and definitions for Highcharts on the server side. 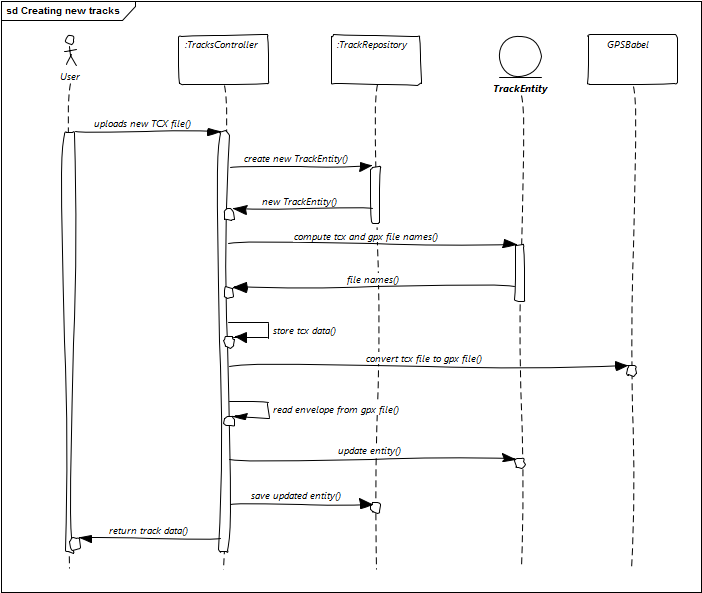 The TrackRepository is a Spring Data JPA based repository for TrackEntities. The TracksController and the OembedController access it to retrieve and store instances of TrackEntity and provide external interfaces. Generated JAXB classes for parsing GPX files. Used by the TracksController to retrieve the surrounding rectangle (envelope) for new tracks. 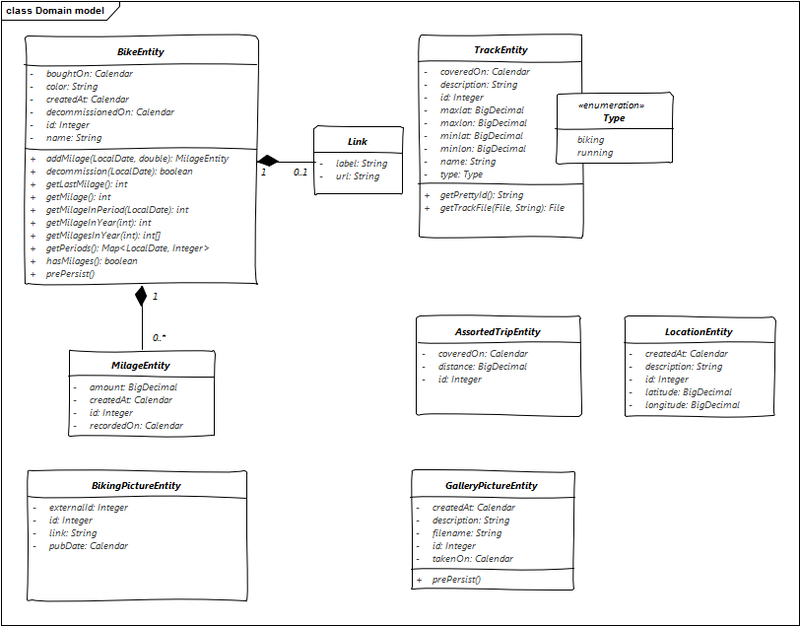 The AssortedTripRepository is a Spring Data JPA based repository for AssortedTripEntities. 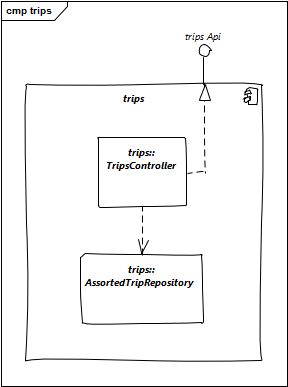 The TripsController accesses it to retrieve and store instances of TrackEntity and provide external interfaces. Locations are stored and read via a Spring Data JPA based repository named LocationRepository. This repository is only accessed through the LocationService. The LocationService provides real time updates for connected clients through a SimpMessagingTemplate and the LocationController uses the service to provide access to all locations created within the last 30 minutes. 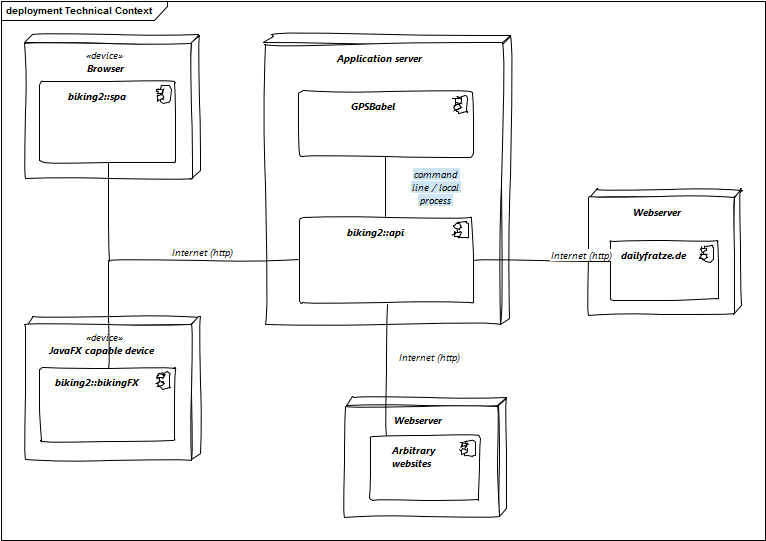 New locations are created by the service either through a REST interface in form of the LocationController or via a MessageListener on a MQTT channel. 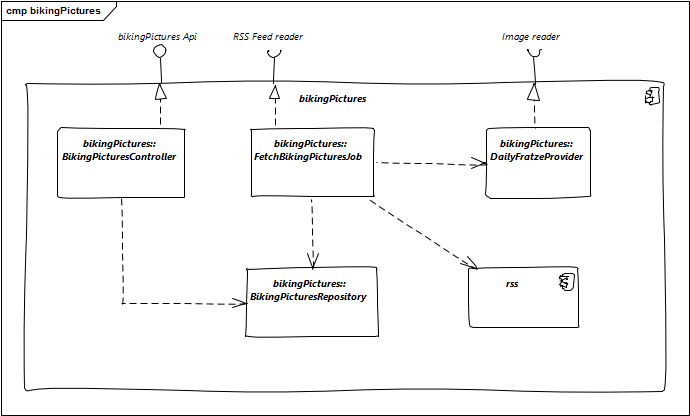 A Spring Data JPA repository named BikingPicturesRepository is used for all access to BikingPictureEntities, the external REST api for reading pictures is implemented with BikingPicturesController. The RSS feed is read from FetchBikingPicturesJob by using a JAXBContext "rss". The URLs to the image files which may are protected by various means are provided to the job via a DailyFratzeProvider. Generated JAXB classes for parsing RSS feeds. Used by the FetchBikingPicturesJob to read the contents of an RSS feed. 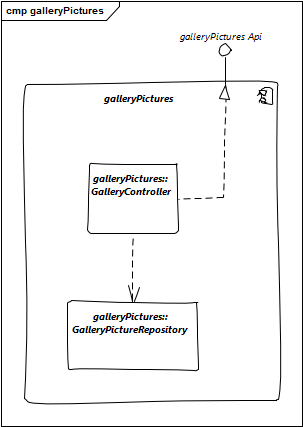 The GalleryPictureRepository is a Spring Data JPA based repository for GalleryPictureEntities. The GalleryController accesses it to retrieve and store instances of GalleryPictureEntity and provide external interfaces. User interaction with biking2 and error handling is pretty basic and simple. Where biking2 development takes place, standard computer with JDK 8, Maven and GPSBabel installed. A host on Uberspace where biking2.jar runs inside a Server JRE with restricted memory usage. A "fat jar" containing all Java dependencies and a loader so that the Jar is runnable either as jar file or as a service script (on Linux hosts). A recent browser to access the AngularJS biking2 single page application. All major browsers (Chrome, Firefox, Safari, IE / Edge) should work. Stores the bikes. Contains dates when the bike was bought and decomissioned, an optional link, color for the charts and also an auditing column when a row was created. Stores milages for a bike (when and how much). Stores GPS tracks recorded and uploaded with an optional description. For each day the track names must be unique. The columns minlat, minlon, maxlat and maxlon store the encapsulating rectangle for the track. The type column is constrainted to "biking" and "running". Stores a date and a distance on that day. Multiple distances per day are allowed. Stores arbitrary locations (latitude and longitude based) for given timestamp with an optional description. Stores pictures collected from Daily Fratze together with their original date of publication, their unique external id and a link to the page the picture originaly appeared. Stores all pictures uploaded by the user with a description and the date the picture was taken. The filename column contains a single, computed filename without path information. A milage is part of a bike. For each bike one milage per month can be recored. The milage is the combination of it’s recording date, the amount and the bike. The representation of tracks contents. The type is an enumeration. 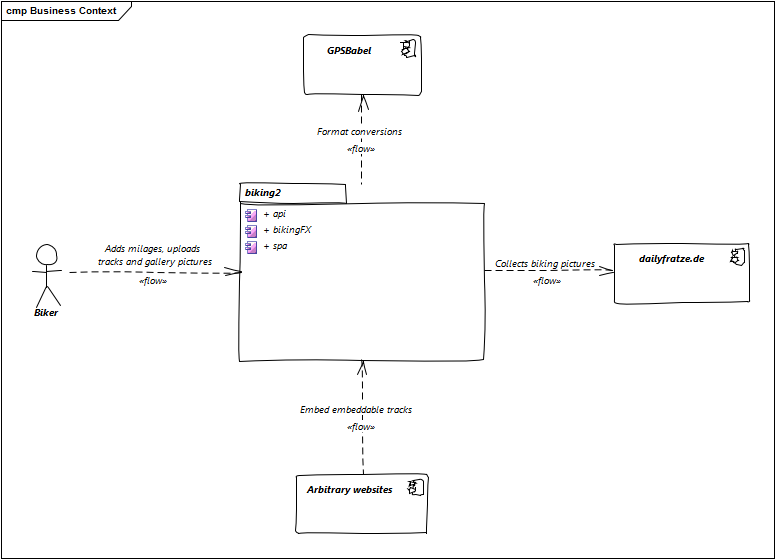 Notable public operations are getPrettyId (computes a "pretty" id based on the instances id) and getTrackFile (generates a reference to the GPS track file in the passed data storage directory). For handling pictures collected from Daily Fratze. The BikingPictureEntity parses the image link on construction and retrieves the unique, external id. A bean for handling the pictures uploaded by the user. prePersist fills the createdAt attribute prior to inserting into the database. This entity captures a distance which was covered on a certain date and can used for keeping track of trips with bikes not stored in this application for example. Used in the tracker module for working with real time locations. Decommissions a bike on a given date. Adds a new milage for a given date and returns it. The milage will only be added if the date is after the date the last milage was added and if the amount is greater than the last milage. Gets all monthly periods in which milages have been recorded. Gets the total milage of this bike. Gets the last milage recorded. In most cases the same as getMilage. Gets the milage in a given period. Gets all milages in a year as an array (of months). Gets the total milage in a given year. biking2 uses an H2 database for storing relational data and the file system for binary image files and large ascii files (especially all GPS files). During development and production the H2 database is retained and not in-memory based. The location of this file is configured through the biking2.database-file property and the default value during development is ./var/dev/db/biking-dev relative to the working directory of the VM. 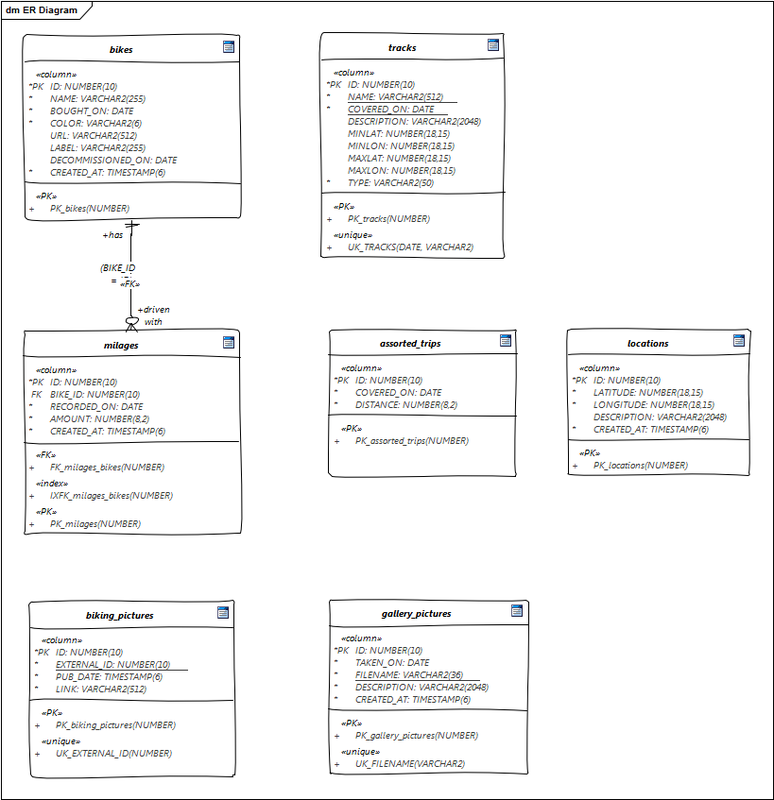 All access to the database goes through JPA using Hibernate as provider. 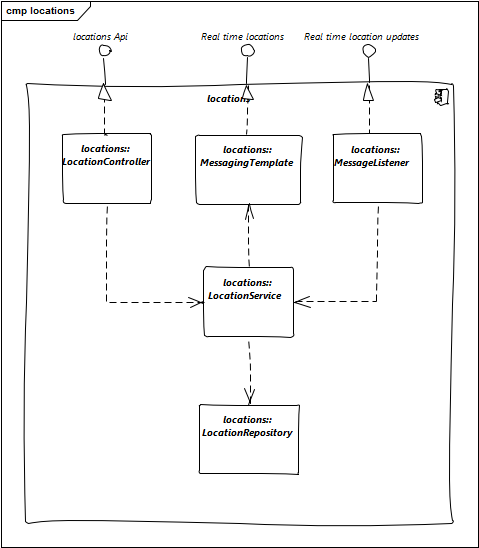 See the Domain Models for all entities used in the application. The JPA Entity Manager isn’t accessed directly but only through the facilities offered by Spring Data JPA, that is through repositories only. For using the realtime location update interface, choose one of the many MQTT clients out there. There is a second user interface written in Java called bikingFX. This model file is filtered by the Maven build, version placeholders will be replaced and all resources, in webjars as well as inside the filesystem, will be available as biking.css and biking.js. How those files are optimized, minimized or otherwise processed is up to wro4js configuration, but minification can be turned off during development. 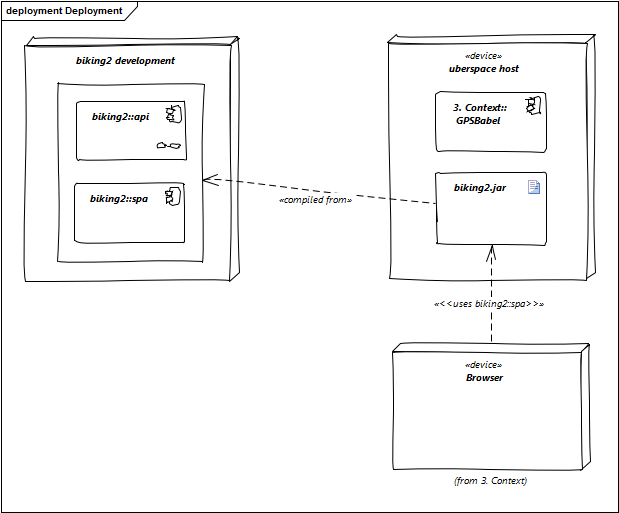 biking2 relies on Spring Boot to create all necessary beans for handling local transactions within the JPA EntityManager. biking2 does not support distributed transactions. biking2 only provides a stateless public API, there is no session handling. biking2 offers security for its API endpoints only via HTTP basic access authentication and in case of the MQTT module with MQTTs default security model. Security can be increased by running the application behind a SSL proxy or configuring SSL support in the embedded Tomcat container. For the kind of data managed here it’s an agreed tradeoff to keep the application simple. See also Safety. No part of the system has life endangering aspect. biking2 uses an internal Apache ActiveMQ broker on the same VM as the application for providing STOMP channels and a MQTT transport. This broker is volatile, messages are not persisted during application restarts. Datatypes and ranges are checked via JSR-303 annotations on classes representing the Domain Models. Those classes are directly bound to external REST interfaces. Bikes which have been decommissioned cannot be modified (i.e. they can have no new milages): Checked in BikesController. For each unique month only one milage can be added to a bike. Checked in the BikeEntity. A new milage must be greater than the last one. Also checked inside BikeEntity. Errors handling to inconsistent data (in regard to the data models constraint) as well as failures to validation are mapped to HTTP errors. Those errors are handled by the frontends controller code. Technical errors (hardware, database etc.) are not handled and may lead to application failure or lost data. Spring Boot configures logging per default to standard out. The default configuration isn’t change in that regard, so all framework logging (especially Spring and Hiberate) go to standard out in standard format and can be grabbed or ignored via OS specific means. All business components use the Simple Logging Facade for Java (SLF4J). The actual configuration of logging is configured through the means of Spring Boot. No special implementation is included manually, instead biking2 depends transitively on spring-boot-starter-logging. The names of the logger corresponds with the package names of the classes which instantiate loggers, so the modules are immediately recognizable in the logs. Spring Boot offers a plethora of configuration options, those are just the main options to configure Spring Boot and available starters: Common application properties. The default configuration is available in src/main/resources/application.properties. During development those properties are merged with src/main/resources/application-dev.properties. Additional properties can be added through system environment or through an application-*.properties in the current JVM directory. During tests an additional application-test.properties can be used to add or overwrite additional properties or values. Only supported language is English. There is no hook for doing internationalization in the frontend and there are no plans for creating one. biking2 replaced a Ruby application based on the Sinatra framework. Data was stored in a SQLite database which has been migrated by hand to the H2 database. The project contains JUnit tests in the standard location of a Maven project. At the time of writing those tests covers >95% of the code written. Tests must be executed during build and should not be skipped. The application can be build with Maven without external dependencies outside Maven. gpsbabel must be on the path to run all tests, though. GPSBabel converts waypoints, tracks, and routes between popular GPS receivers such as Garmin or Magellan and mapping programs like Google Earth or Basecamp. Literally hundreds of GPS receivers and programs are supported. It also has powerful manipulation tools for such data. such as filtering duplicates points or simplifying tracks. It has been downloaded and used tens of millions of times since it was first created in 2001, so it’s stable and trusted. biking2 uses GPSBabel for the heavy lifting of GPS related data. The project contains a README stating that GPSBabel must be installed. GPSBabel can be installed on Windows with an installer and on most Linux systems through the official packet manager. Under OS X it is available via MacPorts or Homebrew. biking2 needs to store "large" objects: Image data (biking and gallery pictures) as well as track data. I opted for local file system because I didn’t want to put much effort into evaluating cloud services. If biking2 should runnable in cloud based setup, one has to create an abstraction over the local filesystem currently used. By using JaCoCo during development and the build process ensure a code coverage of at least 95%. The architecture should be designed in such a way that algorithms depending on external services can be tested without having the external service available. That is: All external dependencies should be mockable. 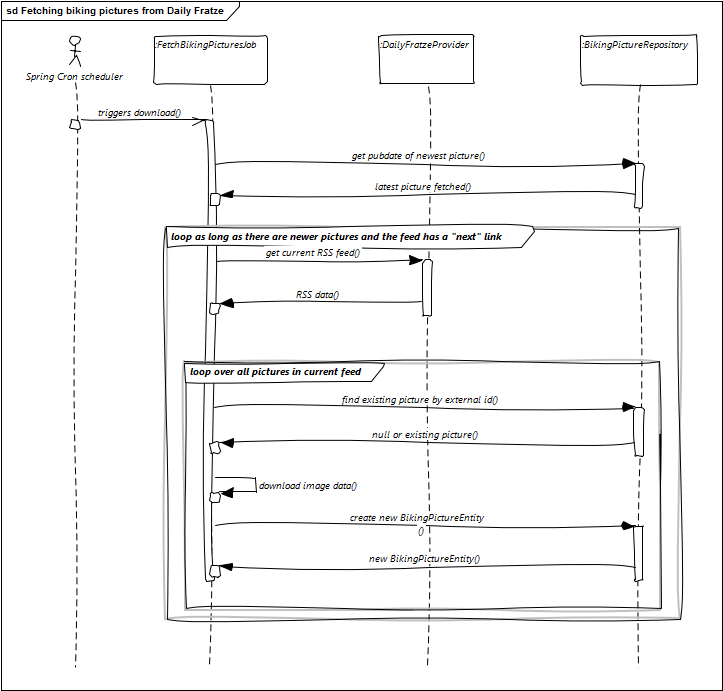 Example: FetchBikingPicturesJob needs a resource containing a RSS feed. Retrieving the resource and parsing it are at least two different tasks. Fetching the resource through a separate class DailyFratzeProvider makes testing the actual parsing independent from a HTTP connection and thus relatively simple. biking2 has been up and running for nearly 2 years now, the architecture contains no known risk for my usage scenario. There is a possibility that the H2 database can be damaged due to an unexpected shutdown of the VM (that is OS or hardware failure). The risk is mitigated through regularly backups of the serialized database file. AngularJS is an open-source web application framework mainly maintained by Google and by a community of individual developers and corporations to address many of the challenges encountered in developing single-page applications. Apache ActiveMQ is an open source message broker written in Java. The Apache License is a permissive Open Source license, especially designed for free software. An online community where users can upload a daily picture of themselves (a selfie, but the site did them before they where called selfies). A way of packaging Java applications into one single Jar file containing all dependencies, either repackaged or inside their original jars together with a special class loader. Pictures from tours provided manually by the hours in addition to the pictures collected automatically from Daily Fratze. Garmin develops consumer, aviation, outdoor, fitness, and marine technologies for the Global Positioning System. GPSBabel is a command line utility that converts waypoints, tracks, and routes between popular GPS receivers such as Garmin or Magellan and mapping programs like Google Earth or Basecamp. JaCoCo is a code coverage library which can be used very easily from within NetBeans. The eight installment of the Java programming language and the first one to support functional paradigms in the form Lambda expressions. [JUnit](http://junit.org/junit4/) is a simple framework to write repeatable tests. It is an instance of the xUnit architecture for unit testing frameworks. MQTT is a publish-subscribe based "light weight" messaging protocol for use on top of the TCP/IP protocol. NetBeans is a free and open Source IDE that fits the pieces of modern development together. The oEmbed protocol is a simple and lightweight format for allowing an embedded representation of an URL on third party sites. RSS uses a family of standard web feed formats to publish frequently updated information: blog entries, news headlines, audio, video. Spring Data JPA, part of the larger Spring Data family, makes it easy to easily implement JPA based repositories. Training Center XML (TCX) is a data exchange format introduced in 2007 as part of Garmin’s Training Center product. © This document uses material from the arc42 architecture template, freely available at http://github.com/arc42. This material is open source and provided under the Creative Commons Sharealike 4.0 license. It comes without any guarantee. Use on your own risk. arc42 and its structure by Dr. Peter Hruschka and Dr. Gernot Starke. Asciidoc version initiated by Markus Schärtel and Jürgen Krey, completed and maintained by Ralf Müller and Gernot Starke. A GET request will list all of the service’s bikes. Flag, if all bikes, including decommissioned bikes, should be returned. A bike manages its total milage at a given date. To make it easy for the user, no difference needs to be calculated, the user can enter the milage of is bike as stated on the odometer or whatever. A POST request will add a new milage to a given bike. Bikes can have an associated story, how they were build or whatever. A PUT request will update a given bike with a new story. "label" : "Nie wieder Stadtschlampe"
The reponse is an updated bike. To keep track of all milage including time not spent on persistent bikes, the user can store assorted trips. A trip is a distance covered at a certain date.